This is a tall evergreen, coniferous tree species found from Alaska and the Yukon south to Oregon, Northern Nevada, Arizona, and New Mexico. Usually straight tree, seldom over 35 m tall (up to 50 m in some areas), with distinctly spire-shaped crown; bark grey, smooth, with resin blisters, becoming somewhat ridged with age; branches not spray-like; a common tree-line species, in stunted form. Needles flattened, blunt and usually notched at the tip; bluish-green, flat above, ridged beneath, having stomata on both sufaces; (2) 2.5-3 (4) cm long, tending to curve upwards, not horizontally spreading. Seed cones erect, deep purple, 6-10 (11) cm long, 3-3.5 cm thick, the bracts deciduous; pollen cones bluish. 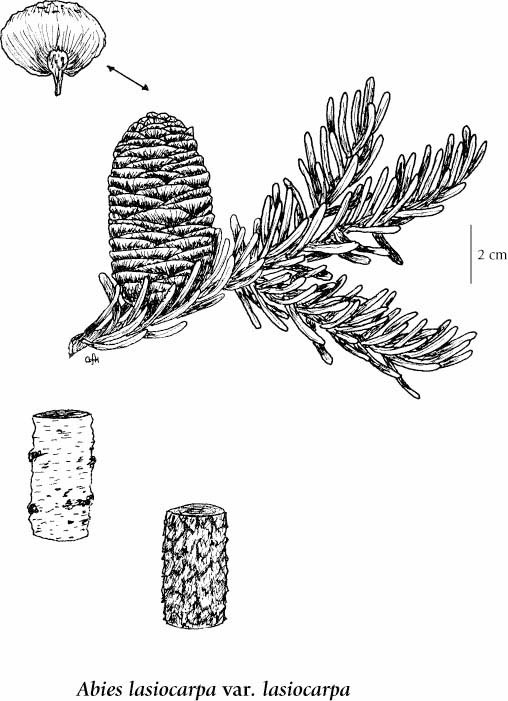 Note: In the recently published Flora of North America, Hunt (1993) recognized Abies lasiocarpa as occurring only along the coast with the interior populations assigned to Abies bifolia. Differences between the two occur in the wood chemistry, lack of crystals in ray parenchyma in A. bifolia, shape of basal bud scales, and color of the periderm. However, introgression occurs throughout most of BC, thus hybrid populations predominate. The only unique populations of A. lasiocarpa are in coastal Alaska. Due to the introgression in BC and the relatively minor morphological differences between the two taxa, we include A. bifolia within A. lasiocarpa. Moist to mesic slopes in the montane to alpine zones; common in BC in and E of Coast-Cascade Mountains, locally frequent on Vancouver Island; N to S AK and YT, E to SW AB and S to OR, N NV, AZ and NM. A shade-tolerant to shade-intolerant, montane to subalpine, Western North American evergreen conifer distributed less in the Paci­fic than the Cordilleran region. Occurs predominantly in continental boreal climates; its occurrence increases with both elevation and continentality. Grows in mixed -species stands (usually with Engelmann spruce, Pacific silver fir, or mountain hemlock) on leeward slopes of Vancouver Island and Coastal Mountain Ranges. There are occasional pure stands at high elevations on exposed outcrops of base­rich rocks, or on valley bottoms affected by cold air drainage. On sites where it is shade­tolerant, it regenerates under closed-canopy stands, particularly on mycorrhizal Mors. (The mycorrhizae here may explain its tolerance of nutrient-poor soils.) Most productive on montane, fresh to moist, nutrient-rich (seepage) sites within wet cool temperate climates. Characteristic of continental boreal forests.